Dario Argento's third true horror film was not only the end of his infamous (if in no way structurally connected) 'Animal Trilogy,' but also served as a cementation of his unique brand of stylistics prior to delving into 1975's Deep Red AKA Profondo Rosso. Having already crafted The Bird with the Crystal Plumage (1970) and The Cat o' Nine Tails (1971), Argento was clearly finalising his thoughts on the giallo form before he would begin work on his strongest entry in the genre. Roberto is plagued by gruesome nightmares and a cold fear of dread. Attacked in his own home by a mysterious and masked intruder, Roberto is further tortured when his maid is brutally killed. Convinced someone is either trying to drive him mad or pin a murder on him wrongly, Roberto hires a private detective. Distraught and frustrated, Roberto's wife Nina (Mimsy Farmer) chooses to leave him and spend some time away. Having discovered the murderer's identity, the detective meets a poisonous end in a subway restroom. Soon thereafter, Nina's cousin Dalia (Francine Racette) finds herself alone with the killer in Roberto's house...and not to her advantage. But all is not lost for Roberto. Police and forensics investigators inform Roberto that recent studies have shown that the last known image a human sees is sometimes 'imprinted' on the retina just prior to the moment of death. Perhaps examining Dalia's eye will reveal the last visual she witnessed: the face of the killer. Will it show a psychotic stranger to Roberto or someone from within his own circle? Notable highlights include Dalia's murder sequence, her bumpy descent down a staircase and the smooth, sliding shot of the knife as it connects to her face. Typically Argento-esque is the scene of Roberto's maid awaiting the killer's arrival in a daylit-graced park. Children play, music emanates from loudspeakers and all is calm. Suddenly and without warning, darkness falls and the park is empty...the killer there but unseen - and the maid on the run for life. 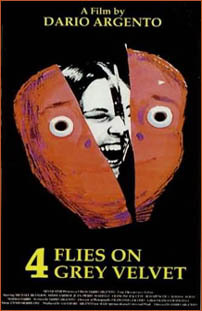 Argento's style in Four Flies comes to real fruition with Nina's decapitation. The stunning, slow motion sequence of Nina rear-ending a trash compactor truck (the edge of the truck crashing through the windshield and cleanly severing her head) garners the optimum effect. The lyrical end score blankets the scene perfectly and provides perhaps an unexpected poignancy to the killer's machinations. Ennio Morricone's eloquent music for Four Flies prefaces Argento's later work with Goblin, providing moments of touching beauty and quiet despair. As a giallo of its form, Four Flies is singularly without flaws, spiralling confidently towards the obligatory revelation of the killer, dotted with the required murders necessary to its conclusion. Aside from some miscellaneous TV work, Argento's next big theatrical horror release after Four Flies would be 1975's masterful Deep Red. Four Flies on Grey Velvet is alternately known as Quattro mosche di velluto grigio and also as Four Patches of Grey Velvet.